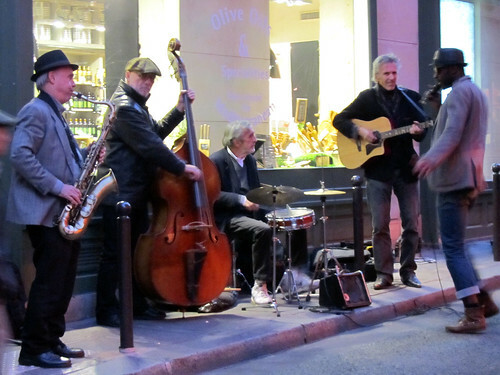 Paris loves jazz. Or maybe it’s jazz loves Paris. Either way, they are good things, because I love both. It means while I explore the nooks and corners of the city, I could always count on coming across someone playing live jazz. It could be a bar, or it could be on the street. I’ll take whichever comes my way. At this moment, I could sway and dance to the music, or barely tap my foot in sync with the melody. Instead, I am trying hard to keep still, from not humming the song and let it vibrates through my body. I already only have a small compact camera and it’s getting dark, so two strikes against the possibility of good pictures. In fact, I don’t think I’ll be successful in getting a single sharp photo of this quintet, but that’s ok too, because I am too happy to care.